Rex A. McClelland, aged 82, passed away on January 14th, 2019, at Somerby of Santa Rosa Beach, where he resided in their Assisted Living facility. Rex, a retired Delta Airlines executive, was preceded in death by his parents, Clyde and Edith McClelland, his wife Alice, and his son Jeff. Rex is survived by his wife of 26 years, Joan, son Greg, stepson Jim and Jim’s wife Sue, and his three grandchildren Jack, Samantha and Matthew. He was born in Blackwell, Oklahoma, and grew up in Springfield, Missouri. He joined Delta a couple of months prior to his 19th birthday. 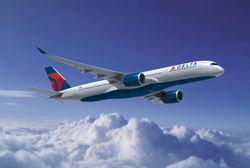 Rex was drafted and served in the US Army in Chicago for three years, then rejoined Delta in Chicago, quickly rising through the ranks of Delta’s organizational structure, moving to the Properties department at Delta Corporate Headquarters in Atlanta in the 1960s. In the Properties Department, he held the positions of Regional Manager, Director, Assistant Vice President, and Vice President. While in the Properties Department, Rex was instrumental in negotiating a number of key airport agreements with the most notable being the Hartsfield-Jackson Atlanta International Airport lease to create the new Midfield Terminal Complex in 1977. That facility was completed in September 1980. Through his strong negotiating skills, he positioned Delta with facilities that remain in place today and Atlanta continues to be not only the largest airport in the world, but also the most efficient and lowest cost of any major airport hub in the world. He was also responsible for Delta’s lease negotiations for design and construction of the Dallas-Ft. Worth airport in the later 1970’s. DFW is the only new major airport to open in the U.S. since the late 1970’s and today is among the largest airports in North America. In 1987, Rex was promoted from VP – Properties to SVP – Passenger Services, responsible for all of Delta’s airport, in-flight service, flight operations, operations control, and on-board service groups with over 25,000 people under his leadership. He also held the positions of SVP – Corporate Services and SVP – Administrative Services prior to his retirement. Rex retired from Delta as a Senior Vice President in 1996 and has resided in the Destin area of Northwest Florida since 1998. Rex enjoyed golfing with his wife, Joan, and his many friends, as well as reading, traveling, entertaining, and the fellowship of his many friends and neighbors. Retirement trips typically included all those activities and more. Travel destinations included Norway, Spain, Ireland, Scotland, Italy, Australia, New Zealand, Hawaii, and numerous cruises to all the Caribbean Islands, as well as cruising through both the Mediterranean Sea and the Panama Canal. Rex was an incredibly positive and happy individual, always with a smile on his face; he loved life, his family, and the joy of spending time with his friends. In lieu of flowers, please consider a donation to the Fort Walton Shelter House, the Atlanta Union Mission, or your favorite charity. He will be missed by all.